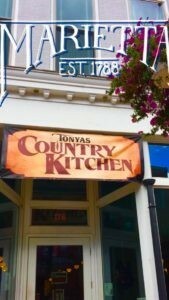 ﻿ Tonyas County Kitchen - Ohio. Find It Here. Come and enjoy homemade and home cooked food right in the heart of downtown Marietta. Burgers to breakfast, and everything in between, Tonya's Country Kitchen offers a variety of food and daily specials. Located on Front Street in Marietta, Tonya's fun diner atmosphere allows customers to enjoy the historic beauty of Marietta. Be sure to check out their Facebook for daily specials, and come see why people love them!